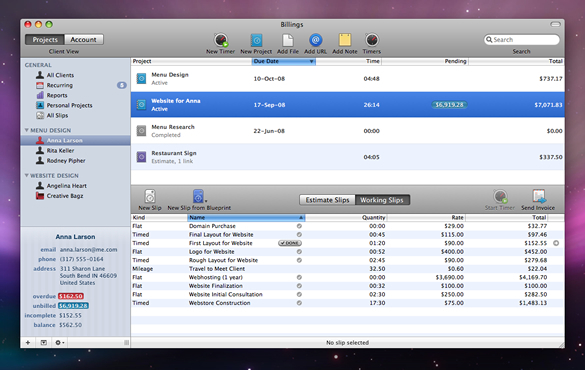 Enter To Win One Of Three Copies Of Billings 3 : Time-Tracking And Invoicing For OS X! The 3 lucky winners are below. We used random.org to pick the winners! I am always looking into ways of making the (often time-consuming and painful) tasks of billing and invoicing easier and quicker. Guess what? Billings 3 helps me do just that! I’ve been using it for some time now and I’m really liking it. So much that we’ve partnered up to do a giveaway here on SpyreStudios! First, What Is Billings 3? Billings 3 is a time-tracking, billing and invoicing tool for Mac OS X. 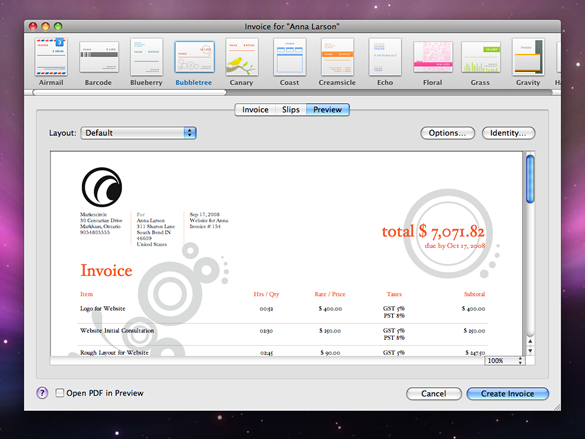 It features time-tracking, recurring and one-click invoicing, beautiful invoice templates, and a lot more! Hey and it recently won an Apple Design Award! Leave a comment on this post: Tell us why you’d like to win a copy! Write about it on your own blog: Let your readers know about this giveaway! You have until midnight (EST) on September 6th to enter the giveaway! The winners will be chosen randomly on September 7th and announced on SpyreStudios shortly after. I would love to win a copy of Billings. As of now, I am using Excel to try to keep track of my invoice information. 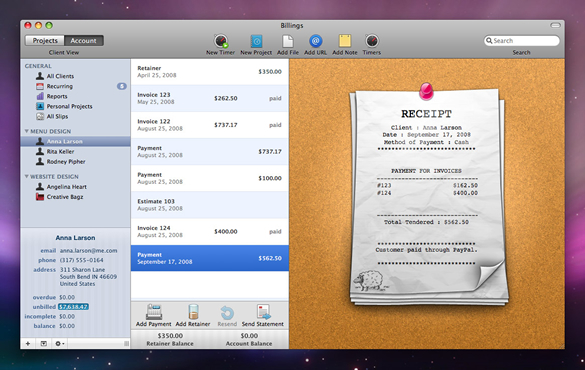 However, I just purchased a MacBook Pro, and this looks like it would make things SO much easier. Even if I don’t win, thanks for bringing this app to my attention. As a freelancer slowly starting to rely on my design work as the premium source of income, I really appreciate what this app can do for me. Will check it out. I’m starting to do some design work on the side for friends and some smaller clients. I think Billings 3 would be an awesome application to have and make for a smooth work flow from start to finish. It looks like a clean and simple interface that I would enjoy using daily. I would love to win a free copy!!!! I’ll keep my fingers crossed. Thanks! I just left my full time job and have begun freelancing full time. I would love to decrease the amount of time I spend on billing clients and keeping track of invoices and this software looks amazing! Thanks for the opportunity, I hope I win! I’ve been eyeing Billings for a while now, and absolutely love the quality and beauty this app has to offer. It looks to be the best of its kind. I’ve been freelancing for nearly 30 years and I’m real tired of QuickBooks. I think that Billings 3 could get me outta the QB rut and into the fast lane. I’d like to win this because I’m broke, disorganized, and have a hard time billing clients when I actually get one. 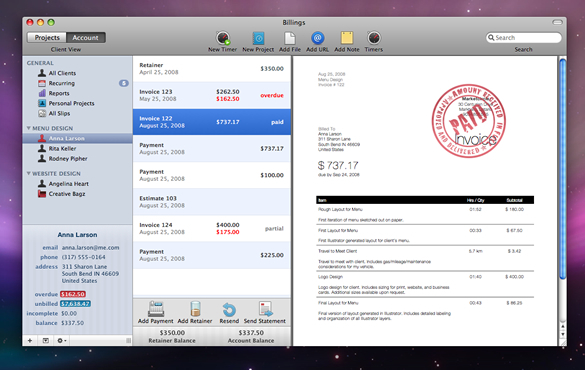 I just bought a billing software for mac and didn’t really like it. I’d like to give Billing 3 a try. I would like to win because using quickbooks once a week blows. I’m starting to freelance a little on my own, and it would be nice to track stuff I do for customers without constantly having to estimate how long each task takes. Additionally, it’s nice to measure the opportunity cost of time I spend browsing the web. Nice reality check! Hope I win the free copy! I’m looking to find something much better than the app I’m using now, which is kind of clunky and not very intuitive. Hi, I’d like to win this software, because it could help me to setup my own web development company and keep an eye of my budget and invoices. to be even more awesome! Just bought a brand new iMac and I’m starting my own business. This app would be perfect! Hi, I’ve just made the first steps into the world of freelancing and the management of an own business, therefore it would be pretty nice to have such an awesome program on my machine. http://twitter.com/seb86/status/3686600360 I would love to win this product. It will help me with my business very well. I’d like to win because I’ve been after some software that does this for a while, I just never got around to buying it! I was just looking for software exactly like this! I’ve just started my own freelance business and this would help so much! Awesome! I’ve been thinking about getting my hands on a copy of this software. It would be perfect for me, just starting out into freelancing and such! Thanks! I’d like to win for help me to starting my freelancer activity! Thanks! I have recently started doing more contract work, and need a solid invoicing system… it looks to me like Billings would be a huge help in that area! We’ve been using Studiometry for a few years now. It’s kind of a clunky beast. They just upgraded their interface to match apple’s design standards, but Billings looks far and away much better than Studiometry. Would like to get my hands on it and give it a try. A simple and intuitive app to get an efficient management of our business. I like soft for mac. I have tried out billings and found it to be one of the most useful and elegant Time Tracking apps available for the mac. I would love to win a copy for my own use. I’ve got pretty invoices but am terrible at keeping track of them– who has paid, who hasn’t, who is late… I hear it’s easier to get paid if you’re organized. I’d love to get a copy of Billings so I can have one easy application to use to track my time and payments. It would really simplify my business process. My current method for keeping track of invoices is awful. This would definitely help make things easier! Thanks! I really want to win a copy of Billings. For me, it is a spectacular application for my freelance business. I tested a beta version and all my teammates fell in love with all the options to do. Works well in the Latin American market. I’m starting off my freelancing career, while still a student. I lead a busy life between projects, so this would really help out! About to kick off some freelance biz, this would be an awesome tool to help get the ball rolling. Billings 2 is an excellent product. It makes managing time and clients soooo much easier. Just seeing the enhancements for Billings 3 makes me all warm and fuzzy inside. I haven’t gotten around to purchasing yet, and I’m glad I held out. I hope I win. I’d love to win this software. It would be a great software for a freelance designer like me. I found out it is Snow Leopard Compatible. This software looks awesome! I would love to get my hands on a copy!